Going out and staying on the water is one of the most relaxing things anyone can do. 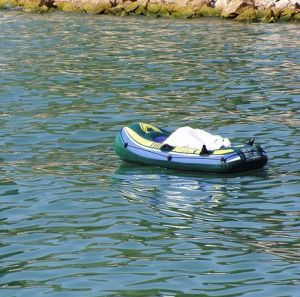 The best inflatable boat is a good way to be able to this by yourself or with someone else. These types of boats offer the extra benefit of not only being cheaper in cost but are also much easier to store away as well as transport from one place to another. Very convenient, these modern floating devices let you row and relax. Plus they come with very efficient air pumps that inflate the entire device in just a few minutes without you having to do much work. Best Inflatable Boat for One Person: This is top pick when it comes to something that’s easy to inflate, offers you good control and comes at an affordable price. This boat is a kayak which gives you more control, plus allows you to sit forward while rowing. This in contrast to rowboat style boats where you sit with your back facing front for more efficient rowing. The Intex Challenger K1 kayak is a single passenger inflatable kayak with a capacity for safely carrying 220 total pounds. The cockpit is generously sized and the inflatable seat also contributes to a kayaker’s comfort. The I-beam design of the floor enhances the craft’s stability while the colorful graphic design help assure other boaters see you in time to avoid a mishap. Cargo netting in the bow provide a means of restraining your equipment or refreshments. Also, grab lines on either end of the K1 provide a means for transporting it. This product weighs a total of 27 lbs. and measures 108” long by 30” wide and 15” high. It is built to be durable while the included pump offers a quick way to get it inflates (around 10 to 15 minutes). This kayak is meant for use on lakes or slow moving rivers. Cheap Inflatable Boat: Should want something that’s on the less expensive side, this is a good choice. This boat is geared more for fun and recreational purposes. It is designed to fit up to 2 people maximum. The Intex Explorer 200 is an inflatable boat with room for two people whose weight, combined with any other materials they bring with them, totals 210 pounds or less. Unfortunately for most of us, that pretty much means 1 adult person and a child at most. The Explorer 200 is constructed from 13 gauge PVC plastic, weighs a very light six pounds and has dimensions of 73” long by 37” wide and is 16” high when fully inflated. Two separate air chambers enhance safety by assuring one puncture won’t be able to deflate your craft completely. a set of 48 inch long oars. The oars can be placed in their oar locks when not in use. A rope handle on the bow also provides the means for easily moving your boat from place to place. This recreational craft is meant for use in calm, quiet waters. If you wish to enjoy more adventure in a boat that offers more weight capacity, this 2 person kayak, which is a bigger version of the Challenger K1 above is a better option. The Intex Challenger K2 is an inflatable 2 person kayak strong enough to carry as much as 350 pounds of total weight. This coast guard approved craft is great for quiet lakes and slow moving rivers. It is built from a durable vinyl material which gives you the assurance that it is puncture resistant and won’t give out on you while you’re in the middle of a body of water. The material is likewise UV resistant. These features mean you’ll have long years to enjoy your Challenger K2. The K2 comes with very useful cargo netting in the forward area. This provides you and your companion with a means of storing and restraining any extra equipment, refreshments or other items that you might choose to bring along. There are two inflatable seats with back rests for this kayak which must be considered the best inflatable boat because of its comparative versatility and superior carrying capacity. Designed for a fun time in the water, this is the cheapest inflatable boat among our reviews. It is a 1 person boat and fun for the kids and young teens to enjoy. The Intex Explorer 100 has unique graphics to allow it to be seen by other boaters. This single passenger inflatable boat is designed for recreational use in the calm waters of a swimming pool or quiet pond or lake. A rope handle on the bow provides a means for towing your craft. Meanwhile, oar locks make it possible to set the oars down and relax for a time. Double air chambers provide added assurance of safety. The inflatable floor contributes to safety as well as comfort. This Intex craft has Coast Guard recognition and a total weight capacity of 120 pounds. The dimensions are 58” long by 33” wide and is 14” high when fully inflated. Having the best inflatable boat lets you get out into the water whenever you want to relax and take time out from your daily routine. They’re very convenient to use, fun and easy to inflate and deflate.